Thumb Up: Montreal Canadiens goaltender Carey Price was named winner yesterday of the 2015 Lou Marsh Trophy as Canada’s topmost athlete. He’s the ninth hockey player to be so recognized since the award was first given in 1936, and the only goaltender. Those who’ve gone before: Sidney Crosby (twice), Wayne Gretzky (four times), Mario Lemieux, Guy Lafleur, Bobby Clarke, Phil Esposito, Bobby Orr, and Maurice Richard. 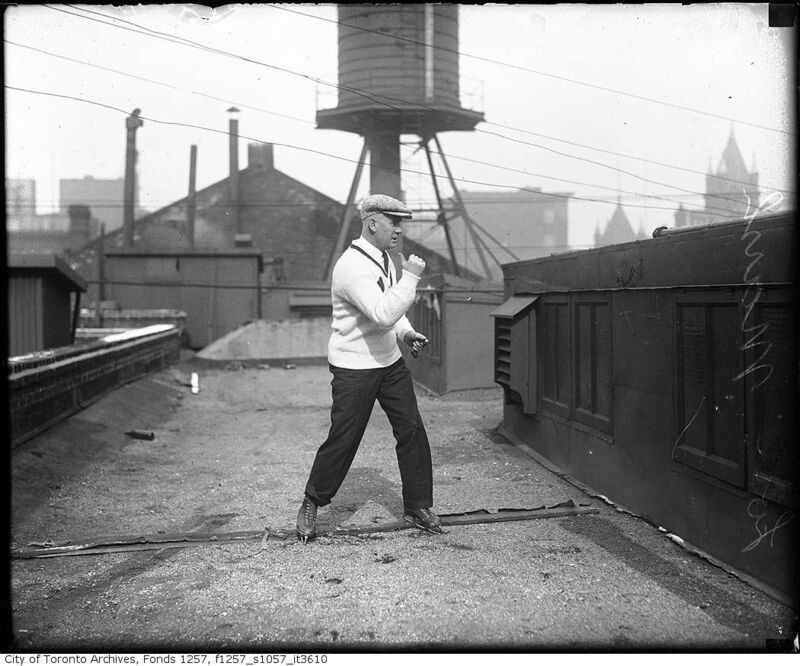 Above, Lou Marsh himself takes the air high up in Toronto, wearing his NHL reffing get-up circa the late 1920s. When he wasn’t whistling at hockey games, Marsh was a beloved Toronto Star sports columnist and editor who also made his mark on the football field, as a sprinter, and as an arbiter of boxers and wrestlers.